You can create your own design or use any project or pattern. 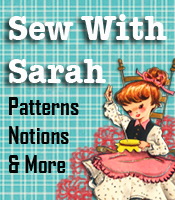 Your project must include fabric, thread and at least one notion or trim. Some portion of the project must have been sewn using a sewing machine. Any additional techniques, embellishments or design touches are your own choice. You can choose to enter any one of these categories – fashion/garments, personal items, home dec (including kitchens and outdoor), sewing room, travel, pets, office/work or auto. One entry per person and your project must include a description of materials and techniques (machine sewing, embroidery, hand-sewing, etc.) used to create the project and up to two photographs in jpg format. Contest runs through September 30th and winners will be notified by October 31st. Visit the official contest page for additional details.